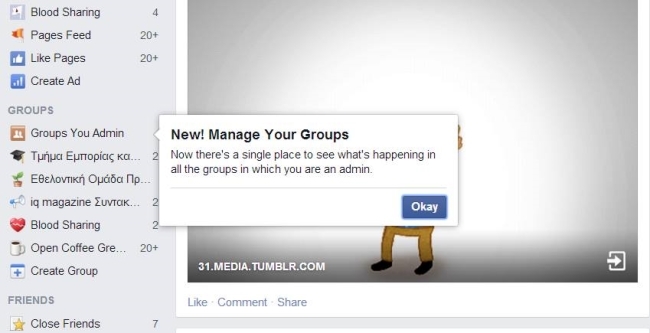 Facebook continues to add features related to its groups, adding a Groups You Admin section to the left-hand-side menu on users’ News Feeds. Group administrators can also add groups they manage to a favorites list to be highlighted in their left-hand-side menus, and settings can be added quickly. Encouraging group admins to add descriptive tags to their groups for easier discovery, in February. Revamping the groups discovery page, also in February. Adding the ability for users of its flagship Android application to upload multiple photos simultaneously to groups, last month. Adding the ability for group admins to review and approve pending posts by group members to its flagship iOS app, last week. Adding group updates to its Paper iPhone app, last week. Thank you to readers Thodoris Konsoulas of Social Media Life and Guillaume Baratte for the tips and screenshots (Konsoulas’ were used). 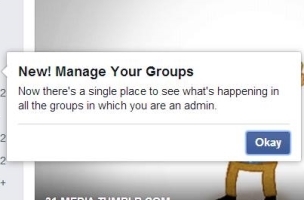 Readers: Do you have access to the new Groups You Admin section?